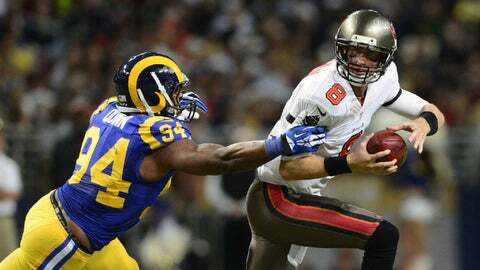 Robert Quinn had three of the seven sacks of Tampa Bay quarterbakc Mike Glennon to give him an NFC-high 18, breaking Kevin Carter's franchise record of 17 sacks in 1999. ST. LOUIS — The toughest part of Robert Quinn’s day was surviving the ride to the locker room. "They hoisted me off," the Rams defensive end said. "I was hoping I didn’t get dropped." Quinn got three sacks to break the franchise season record and take the NFL lead, too, as St. Louis beat the Tampa Bay Buccaneers 23-13 on Sunday. Controlling Quinn and the rest of the St. Louis pass rush had been a Tampa Bay priority. "I’m anxious to watch the tape because I want to see — with some of the things we had in place — how the heck they didn’t slow them down more than they did," Buccaneers coach Greg Schiano said. "We’ve got to find out why." Fellow defensive ends Chris Long and William Hayes waited just inside the tunnel to the locker room and scooped up the 264-pound Quinn. "I’ve never seen anybody like him," Long said. "He deserves it. We don’t just carry any jack wagon off the field." The Rams wore throwback jerseys from their Super Bowl title season and Quinn outdid one of the stars from that team. He has 18 sacks, 1 1/2 more than Houston’s Robert Mathis for the league lead, and broke Kevin Carter’s mark of 17 in that 1999 Super Bowl season. "You see that flash of 94 go past and you think, ‘Oh snap, that quarterback doesn’t know what he’s in for.’"
The Rams won without left tackle Jake Long, who injured his knee on the first series. Coach Jeff Fisher believes Long tore a right knee ligament, adding, "We are anticipating the worst." Zac Stacy rushed for 104 yards on 33 carries and a touchdown, and two other rookies also had big games for the Rams (7-8), who matched their victory total from last year. Stedman Bailey scored on a 27-yard reverse, and Alec Ogletree forced two fumbles. Ogletree stripped Bobby Rainey early in the second quarter. Bailey scored his first career touchdown on the next snap on the reverse to put the Rams up for good at 14-7. The Buccaneers (4-11) managed just 170 total yards, setting a season low for the second straight week. Vincent Jackson had five catches for 98 yards but Rainey was held to 37 yards on 20 carries and Glennon was 16 of 26 for just 158 yards minus 47 yards on the sacks. "I did a terrible job of securing the ball, what I’m supposed to, and I put the game on me," Rainey said. "We played behind because of me." Rainey opened the scoring with a 1-yard run in the first quarter and Stacy scored on a 1-yard run early in the second quarter. There were thousands of empty seats for an unattractive matchup with attendance announced at 54,423 — about 12,000 shy of capacity. James Laurinaitis added two sacks and Greg Zuerlein kicked three field goals, including a season-best 54-yarder in the third quarter after Tampa Bay had cut the deficit to a point. The Buccaneers are 1-6 on the road, the lone win at Detroit that gave them a three-game winning streak overall after an 0-8 start. Tampa Bay finishes at New Orleans next week. Quinn’s first sack helped force the Bucs to settle for a 35-yard field goal by Rian Lindell to cut the Rams’ lead to 14-10 at the half. Bailey has gotten involved in the offense the last few weeks and stepped up with Tavon Austin, his former teammate at West Virginia, sidelined for a second straight week by a left ankle injury. The reverse was his first career NFL TD and first rushing since high school, and he had three catches for 44 yards. "My eyes lit up like a Christmas tree," Bailey said. "It’s been a long time, you know." Bailey was just as prolific as Austin in college, totaling 41 touchdowns in three seasons at West Virginia, but had just two carries for 13 yards. NOTES: The Rams unsuccessfully challenged the spot after T.J. McDonald sacked Glennon at the 1 on a blitz in the second quarter. … Rams Hall of Fame tackle Jackie Slater was introduced during a break in the first quarter. … Bucs rookie DEWilliam Gholston made his first career start. … Zuerlein is 1 for 2 from 50 yards this year. He was 7 for 13 last year as a rookie, setting a franchise record with a 58-yarder and then breaking it with a 60-yarder at home against Seattle.